But those stories are nearly always big stories (by tabloid measures), and the running gags are always their own. Here, the Star is emulating not itself, but the Sun: it is running a story with no front-page value simply so that it can echo a 30-year-old headline published in its closest rival. This would be weak splash even if they were repeating their own joke; it’s quite disconcerting that they’re repeating someone else’s. It seems almost deferential. 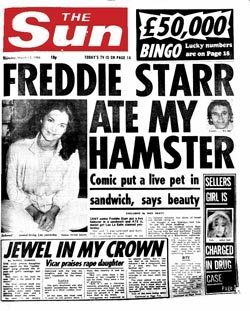 And if you were a millennial tabloid reader who’d never heard of Freddie Starr, what on earth would you make of it? 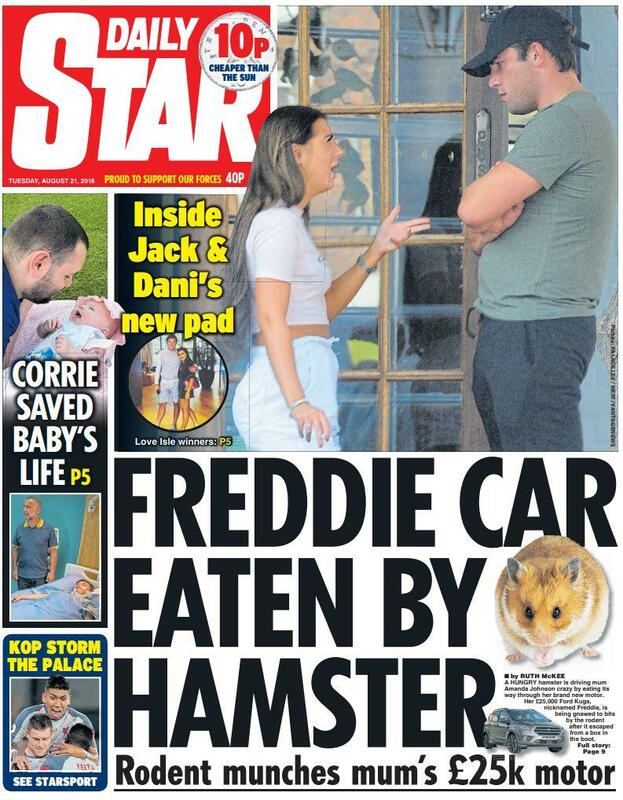 * Indeed, this is what happened here: the car’s owner, Amanda Johnson, recalled the Sun’s famous story and retrospectively named the car Freddie because it was being eaten by a hamster. ** For example, after England’s dismal 2-1 loss to the Swedes turned the press against the national team’s manager, Graham Taylor, his departure the following year was heralded with the headline THAT’S YER ALLOTMENT. No matter how far a British warship sails, she’s always under the watchful eye of the Daily Mail. More so than ever these days, now that the Mail has fully functioning newsrooms on three continents, all operating entirely transparently to its global readership. Well, almost. Observe as 65,000-tonne HMS Queen Elizabeth sets off for the US on Saturday, a £3bn aircraft carrier on her maiden voyage, picking up two “US F-35B” fighters on the way. 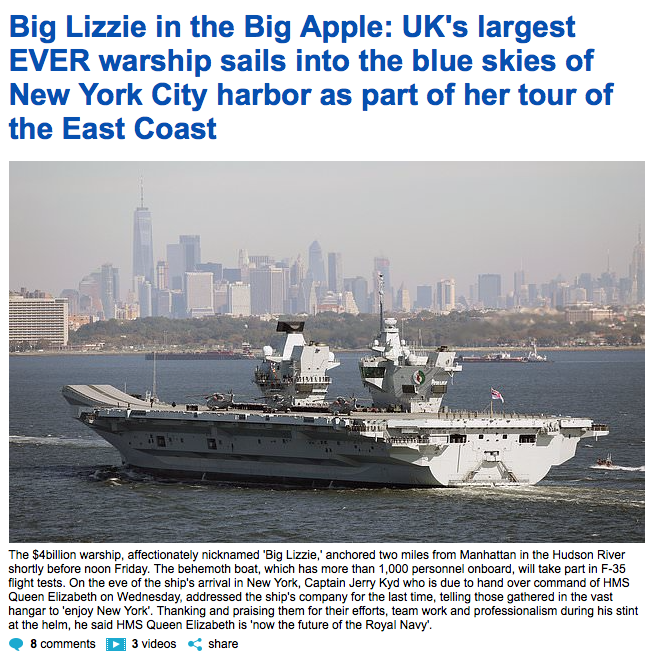 Weeks later, she “sails into the blue skies of New York City Friday” (the skies? ): safely arrived, but now a “70,000 ton” ship costing “$4bn”, “multimillion-dollar” fighters embarked and accompanied by a quote from the “UK defence secretary”. As we have discussed before, it’s not the big things that confound the emerging anglophone news agenda: everyone’s interested in Trump, Instagram models, celebrity affairs and viral video, no matter where they originate in the world. It’s the small things, the detail points that betray who you really think you’re writing for: the weights and measures, the indications (or not) of nationality, the brief explanations of localisms considered necessary or unnecessary. It may be a British-built ship flying American-made fighters, but all the available dialects for this story are local: there is no global English for the global newsrooms to speak. Do readers notice? They don’t seem to complain. Well, not often. Blackburn Rovers’ Bradley Dack and his reality-star ex-girlfriend are bread and butter for the Mail’s British site, and you might argue that the son of Lance Armstrong is too: but for sure neither Bradley nor (one suspects) anyone else in League One has ever been a “preferred walk-on”*. Of course, that’s because the two men operate in entirely different sports: but last week Mail UK had them both playing “football”. This blog is generally sanguine about the accidental merging of news agendas as media organisations spread out across the anglosphere. A story’s a story, even if confusions occasionally arise over different dress sizes or the fact that more than one country calls its currency the “dollar”. If articles leak across the content management system into other jurisdictions, as one has here, there’s often no harm: British readers are happy to critique an NBA player’s scatter cushions or admire a Jersey Shore star’s $5,000 dress. But this word, you suspect, is going to be a sticking point. In the US, American football is just “football” and football is “soccer”. In Britain, “football” is the game sanctioned by the FA, and all other games with the same name are qualified geographically: American football, Australian rules football, even Rugby football. American readers might be disappointed to discover that a story about a troubled “football player” doesn’t involve the NFL, and in Britain there would be open revolt if UK news organisations routinely referred to the national game as “soccer”, even though the term is British in origin. What we decided to do, as I did my best to explain to the Atlantic, was to honor the individual reporter’s voice. British English would of course be maintained throughout the Guardian newspaper, but online we would follow the reporter’s lead. This approach does, of course, create many problems of its own, not least the one of leaving readers to work out which “football” a news organisation is talking about in any individual story. But not every Americanism or Britishism travels smoothly across the Atlantic: sometimes there’s serious cultural resistance. And when there is, whichever sport you’re talking about, it’s unwise to pick sides. *That is, a college player not good enough to be granted a sports scholarship, but nonetheless likely to see playing time (as opposed to normal non-scholarship players, who frequently must hang on tooth and nail just to stay in the squad). 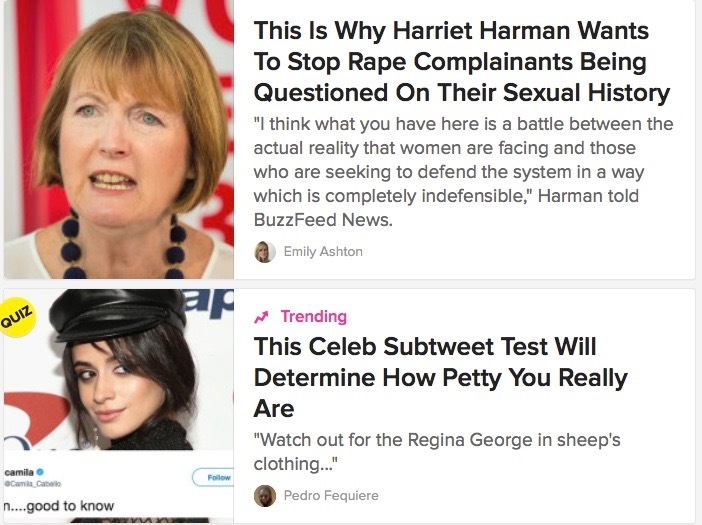 BuzzFeed got the big story of last week, and we’re all talking about it! And the really interesting thing is that, on BuzzFeed and elsewhere, there’s often not the least embarrassment about it. We saw last month that an abashed New York Times recently apologised for citing Twitter user Jillian C York by her temporary Halloween username Chillian J Yikes!. But jokey handles are a part of many online forums, from Tumblr to the Tribune’s comments section, and any sense of loss of dignity or gravitas arising from that informality is quickly evaporating – especially as social media becomes the source, and not merely the conduit, for many news stories. The Macquarie Dictionary, probably the most authoritative source of Australian English, declared its 2017 word of the year to be “Milkshake Duck”* – a phrase coined by the Twitter humourist known only to the world (and, one suspects, to Macquarie as well) as @pixelatedboat. The Daily Mail ran a story about historical sexual harassment allegations sourced from a series of tweets by Canadian user @JodiesJumpsuit without ever identifying her by name. And a few years ago, the Tribune’s economics editor was doing a reader Q&A online and had a very sensible conversation about policy with a reader identified only as “underwearstain”. This isn’t the same phenomenon as the collective irreverence that leads to important research vessels being named (or nearly named) Boaty McBoatface. In cases like that, creating discomfiture in high places is all part of the fun. What’s significant about this, again, is that there is no discomfiture: the profound and the silly are becoming comfortably assimilated in our new global forums. 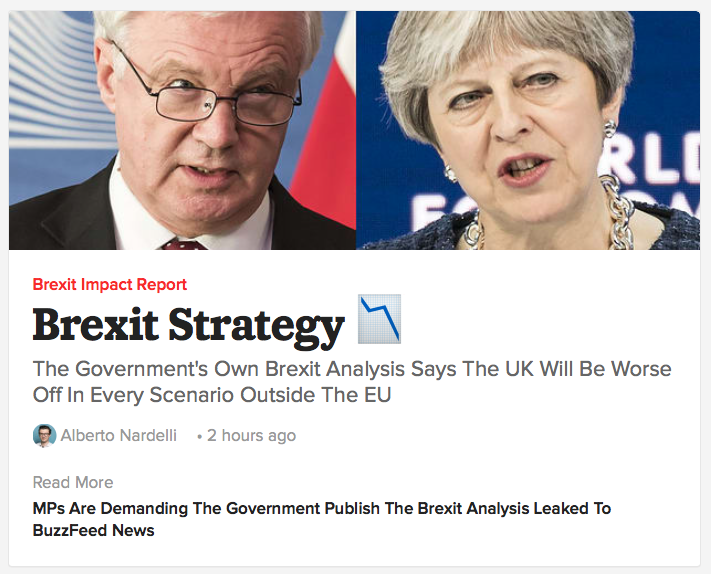 For a Gen-X broadsheet journalist like me, BuzzFeed’s blend of listicles, OMGs and heavyweight Westminster scoops is disorientating in the extreme. But perhaps it’s just at the forefront of a phenomenon that we are rapidly becoming accustomed to elsewhere. BONUS UPDATE: The very day after we were discussing Rebel Wilson and the Australian dollar exchange rate, this appears on the UK homepage of the Daily Mail! Man from Cootamundra (where?) discovers crashed ute (what?) on the Olympic Highway (where?) and, with great courage, pulls him to safety. Now he’s all over the web front page of Britain’s best-selling mid-market tabloid without a hint to international readers about where the drama took place (which is, of course, Australia). If you need footnotes: Cootamundra is a town of about 5,500 in New South Wales; the Olympic Highway is a country road in the southern part of the state, so named because it formed part of the route of the torch for the 1956 Melbourne Olympics; and a ute, that most distinctively Australian of vehicles, is a light pickup truck based on a saloon car chassis (it’s short for “utility”). 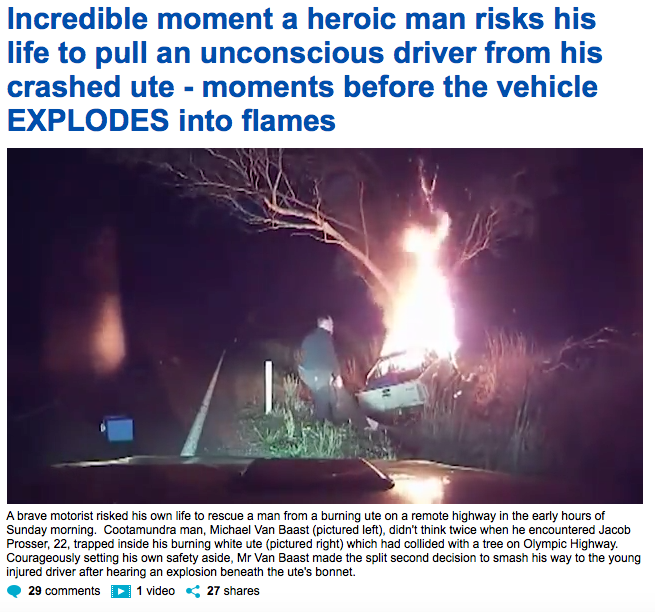 None of these explanations make it into the front-page standfirst for British readers, although on the article page itself, there is at least a description of Mr van Baast as an “Aussie hero” in the display type. In fact, the story is written from such a defiantly local angle that one suspects even readers in other parts of Australia might be nonplussed: it’s not clear how familiar readers in Perth might be with the name of an inland rural highway through another state, even though viewers of Prime 7 News Wagga Wagga (which provided the dramatic pictures) would know at once. But it also underlines the other emerging trend in the globalising digital news agenda: that, from celebrity photoshoots to fiery rescues, a story’s a story, wherever you are in the anglosphere. That doesn’t sound good: “nearly one in four” of young people voting for an “imaginary alternative candidate”? But then you read on, and – most unusually for journalism – you find that there are even bigger numbers in the third paragraph than there are in the first. 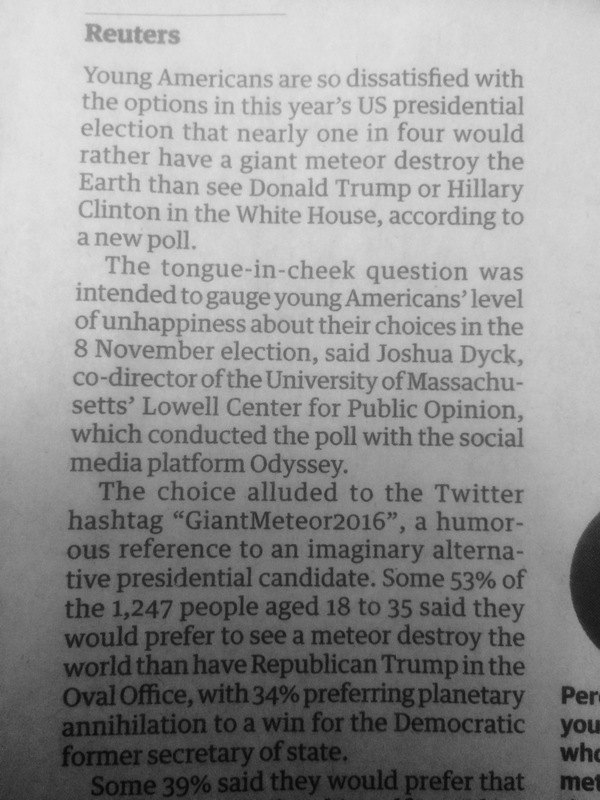 Some 53% of the 1,247 people aged 18 to 35 said they would prefer to see a meteor destroy the world than have republican Trump in the Oval Office, with 34% preferring planetary annihilation to a win for the Democratic former secretary of state. This almost never happens: the standard newspaper rule is that the largest number – in an election, a poll, a statistics release – is the news. The tendency is to calculate the worst possible case, the theoretical maximum jail term, the largest achievable bonus payout, and set your baseline at that. This is how the term “headline figure” has come to have a qualified edge to it: even in newsrooms, it means “the number that needs a bit of context” rather than “the definitive total”. But why, then, if Reuters is writing a story about millennial disaffection, is it ignoring the biggest number – more than half of young people would rather face destruction than Donald Trump – in the survey? Why has it led with the finding that, in statistical terms, crosses the line in a distant third place? Because, as an American mainstream media outlet, it has to. Because, in Professor Jay Rosen’s words, it needs to be “innocent”. Alongside the production of news and commentary American journalists working in mainstream newsrooms have to continuously reproduce their own innocence. By “innocence” I mean some kind of public showing that they have no politics themselves, no views of their own, no side, no stake, no ideology and therefore no one can accuse them of unfairly tilting the news this way or that. In Britain, we have the BBC to provide balance while the different sides of Fleet Street wage war on each other’s beliefs. But in America, it’s different. Its geographical vastness helped to create media monopolies, cities in the plain with just three TV channels and a newspaper that had a whole town of Democrats and Republicans to itself. Straight-down-the-middle news, in those circumstances, was not just the fairest approach but probably the best business model too. Since then, as cable news and social media have spread and the culture wars have intensified, there is a new pressure on the mainstream to prove its rectitude under constant accusations of bias – never more so than with political news, and of course never more so than at election time. So, from one aspect the angle Reuters chooses in this story – “young people equally disaffected with both candidates” – might be seen as a classic fair-dealing compromise. But it also generates some misleading implications: an impression of millennial ennui and of a demographic split down in the middle. In fact, the numbers show that many more young people fear Trump than Clinton – a 19-percentage-point difference – and that the nihilistic none-of-the-above option is the least favoured, not the most, of those three choices. Of course, these numbers would swing strongly towards the Republican side if the poll had been conducted among border patrol officers in Arizona or autoworkers in Saginaw. But that’s the point – whichever way a demographic leans, almost none of them can offer the kind of 50/50 balance that a good-faith media organisation would feel comfortable with. Young people are strongly for Clinton; white working class voters are strongly for Trump. Whoever you choose to focus on, innocent, even-handed conclusions are very hard to extract from this sort of sectoral polling. Media organisations on the left and the right are accused of cherry-picking statistics for reasons of bias. The trouble is, in cases like this, impartial wire services are cherry-picking statistics too – except that instead of choosing the biggest number, they are choosing the safest one. Not that any of it matters now, of course, and the interstellar third-party candidate never really featured in the race. But at this rate, possibly more than a quarter of young people may be scanning the Kuiper belt hopefully as we approach the midterms. Back in New York last week, just in time to see spring: sunlight illuminating wide, peaceful Broadway on the Upper West Side, blossom bobbing in the cold wind outside 72nd Street station. Like any Manhattan visitor, I did the Manhattan things one does: walking the High Line, going to a Broadway show, spending five solid minutes looking at the map trying to work out which F trains stop at Second Avenue. * And, of course, I read the New York Times. As a broadsheet journalist, I understand the value of restraint, of course. And nuance, and the plurality of agendas that need to be reflected on a mature front page. But as I read (and, annoyingly, mislaid) an edition last week that was laid out just like the one pictured above, I still found myself wondering: which story’s the splash? Instinctively I look first to the top left of a front page, to the first column, where there is indeed a story: the Bloomberg one. Is that the lead? The famously distinctive typography offers few clues: but the headline for the four column pic story appears to be in almost exactly the same bold italic. Over on the right, though, in column 6, the headline is in semi-bold caps. Does that outrank bold ital? There’s a subhead and a standfirst too: on sheer weight of furniture, it’s probably Saudis that’s the splash, way over on the right. But it took a while to find it. The similarity of headline styles above the fold is one of the most striking things about the NYT to British eyes. It’s not that they’re small; it’s that they seem almost all the same size. By comparison, the template for a big double-page spread at the Tribune envisages a fully 40-point gap between the main headline on the page (66pt bold serif display) and the second and subsequent ones (26pt sans regular). Just add to the confusion, here’s another layout from January with two all-caps headlines, one on the right, one under the picture. Again, the extra trimmings suggest the column 6 story is the splash, but it’s hardly what you’d call over-displayed. In fact, in all three examples, the paper is in effect being led by the photograph – especially the second one, which grandly takes up the first four columns on the page, displacing every headline down or to the right. Typography in British newspapers is designed around the mystique of the splash: the one big story, with one big headline, delivered per day, with a supporting cast of other items as decoration. It makes every front page lively: everything looks good in 72-point bold. But the headline type doesn’t get smaller on a slow news day, so ordinary stories can end up getting a fanfare they can’t quite live up to. British news typography works on a relative scale: forget yesterday or the moon landings – this is what’s big today. By contrast, the standard Times layouts functions at their best on slow news days: days where there are two lead stories, or, frankly, none. 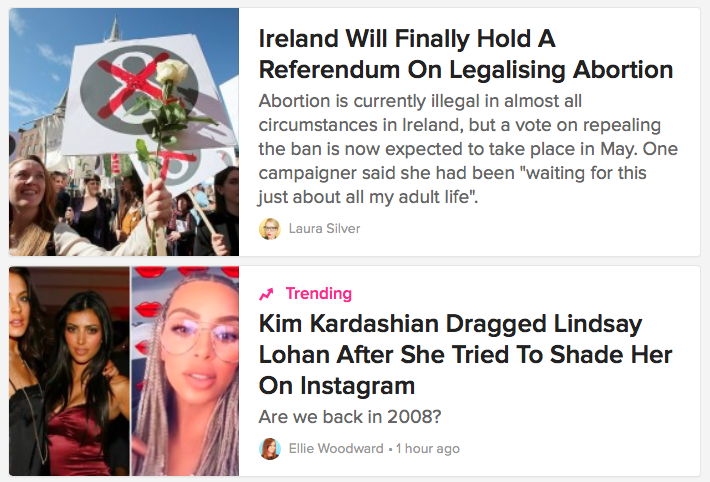 The single-column headlines over single-column stories communicate a judicious calm – a longer view – and a certain sense of honesty about the day’s events: an impression that many things are happening, and many things are news. So if you’re looking at a copy of the Times and wondering what the big story is, you can often find yourself agreeing with the paper: perhaps there isn’t one today. * My provisional conclusion: they all do. In fact, I think, stopping at Second Avenue may be one of the defining characteristics of the F train, distinguishing it from the constellation of alphabetic alternatives (B, D, M etc) that share the line on their way to two different termini in Brooklyn, two in Queen’s and one in the Bronx via six different routes through Manhattan. I think.